Do you ever look at our products and think “I wish I could do that?” Well, you can! And we can teach you! This is more than a “Paint and Sip” party! Our Make and Take Classes will fill you inner need to be Creative! 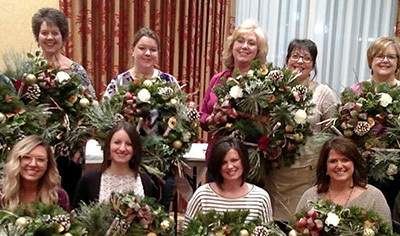 Our classes have a variety of topics such as Wreathmaking, Creating a Holiday Centerpiece for your table, or just a lovely flower arrangement to brighten up your office! Make sure you check out our schedule so you don’t miss any of our fun-filled events! Want to have a special reward for your team at work? We can do a Make and Take Class of your choosing at your place of business! Or, hold one of our classes at your location to attract a crowd and spotlight what you do while combining it with one of our creative events! Click here to see the current schedule of classes and their topics.